Everyone has a story. But some of us face a conundrum. How do we tell our stories so others will hear them? Lyn Christiansen can be the channel to tell your story. Lyn works with her clients interactively, to learn their stories and design and create a special piece for them. learning client aesthetics, developing story motifs, selection and sourcing of primary materials, and defining of menu of secondary elements. Developing and refining detailed design, plans, and schematics and choosing sub elements. Off-site art making and on-site installation and refinement. 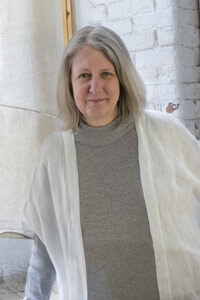 Lyn uses many materials but most of her work involves fiber, stone, or glass. She uses ancient interlacing techniques such as cord twisting and kumihimo braiding. With these complexly patterned braids of hand dyed silk, she forms exquisite wall hangings . She positions, cuts, and shapes stones and glass to make symbolic mosaic patterns on walls, floors, and free hanging panels. She textures marble and forms sculptural substrates to add shape and depth to her mosaic murals. She incorporates water, light, turned wood, wire or found objects to create special effects or add an element of surprise. When she works with clients, Lyn often draws on the talents, skills, and abilities of other artists, makers, and fabricators in her milieu. They bring experience and talents that differ from hers and expand what she can offer. They include professional makers of stained glass, forged iron, mural painting, and animation to name some examples. She enjoys leading these teams and inspiring their best work to further enhance and expand the end result. Christiansen is fortunate to have an excellent working relationship with her key persons on any job that involves stone and mosaic. As the owner of a design and construction business with 25 years of experience in both commercial and residential projects, Keith Cantwell brings the practical perspective that ensures her ideas are doable and reasonable. He is not only a contractor, but adds a background in architecture and a refined aesthetic to any project. Lyn draws on the experience and wisdom of several advisors: Industry advisor, C. Ronald Ostberg, retired Director of Design, Kling/Stubbins & Associates, architects; Resource Advisor, Mary Ann Richman, CEO, Mars Productions, multimedia events, Strategic Advisor, Betsyann Duval, retired CEO, DWB Partners, marketing communications. Lyn’s art works have been shown in juried shows nationally at venues including: H&R Block Art Space, Kansas, City; Museum of Texas Tech, Lubbock, TX; Wayne Stark Gallery, Texas; Acadianna Center for the Arts, Louisiana; The Goldstein Museum of Design, St. Paul, MN; Hansen Memorial Museum, Kansas; Art Windows, Waltham, MA; and the Hoffman Gallery, Portland, Oregon. Her work also was shown at the Attleboro Art Museum, Attleboro, MA.